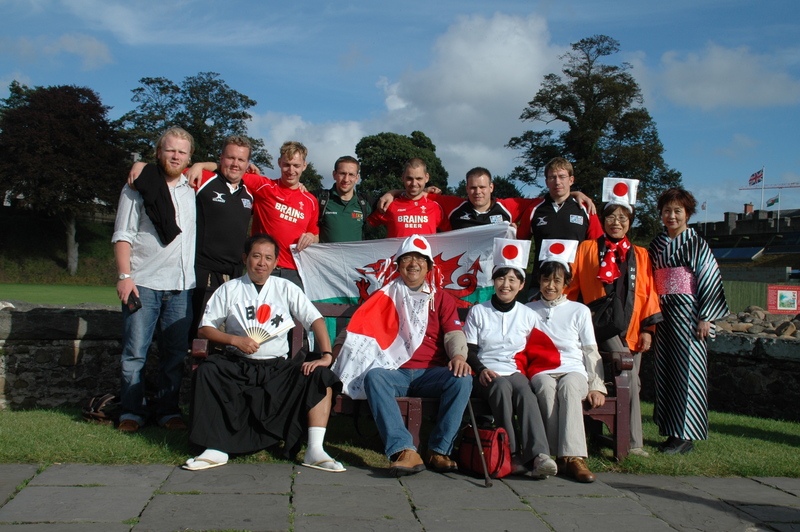 Rugby union is a ball sport. Two teams of 15 players play against each other. The ball used is oval in shape. The field is a rectangle shape. It is 100 metres long and 70 meters wide. At the ends of the field are two H-shaped goal-posts. The game is played for 80 minutes in two 40-minute halves. Another method of scoring points is through penalties. When a team breaks the rules, the referee may award a penalty. The goal-kicker kicks towards the goal-posts. The ball must pass between the two upright goal-posts and above the cross-piece. If it does, the team is awarded 3 points. 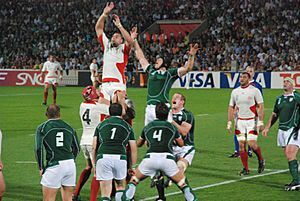 Only the player with the ball may be tackled. 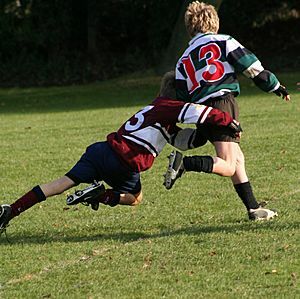 Tackling is when the player with the ball is brought to the ground by an opposition player. 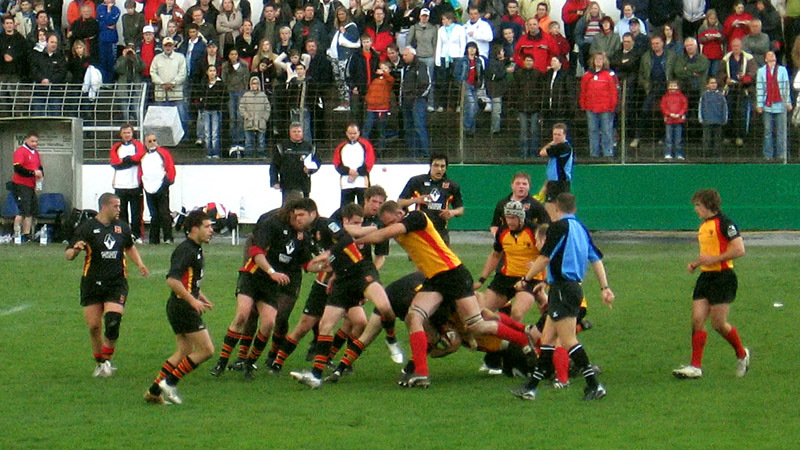 The opposition player must use their hands to hold onto the ball carrier, and wrestle them to the ground. During the game, there are four officials who enforce the rules. 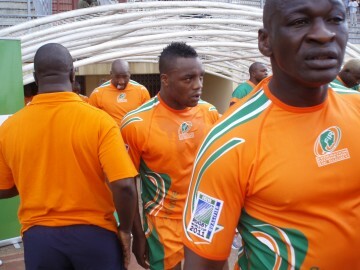 The referee runs alongside players as they play the game. The referee controls the game. The two touch-judges patrol the out-of-bounds areas. They also indicate when a goal kick has been successful. Kicking is very important in rugby. Normally, only the backs will kick. However, you somethimes see the forwards kick. There are different reasons why they may kick. You can kick by doing a drop kick, grubber, up and under, punt, football kick and off a tee. 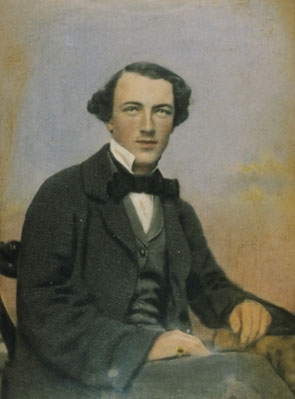 Australian football pioneer Tom Wills drew inspiration from an early version of rugby football he learnt whilst a pupil at Rugby School. Rugby union Facts for Kids. Kiddle Encyclopedia.